Working as a full-time pastor in Roanoke, Virginia, or a volunteer chaplain in Lancaster, Pennsylvania, and taking courses at Eastern Mennonite Seminary are no longer incompatible, thanks to a relatively new option: hybrid courses. 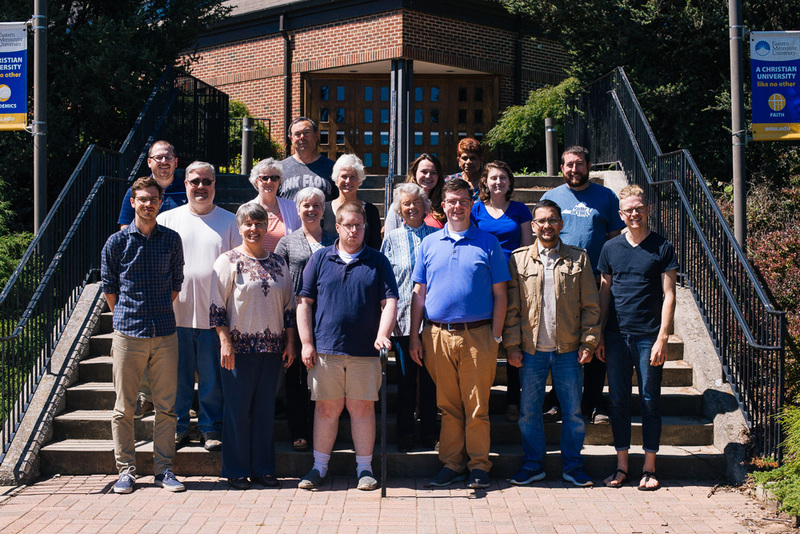 In August, two such courses on the Gospel of Luke/Book of Acts and the psychology of religion – each met for an intensive week of 20 hours of class time, with the remainder of coursework unfolding over seven additional weeks of online interaction. An additional course, on formation in missional leadership, is underway online and will complete its face-to-face component in October. Learn more about distance learning at EMS. The Luke/Acts class brought students from five states, including Adam Stultz, who is pursuing an MDiv while serving as a full-time associate pastor at Summerdean Church of the Brethren in Roanoke, Virginia. Donna Becker, a volunteer chaplain and employee at Landis Homes Retirement Community in Lititz, Pennsylvania, took the class to “learn better ways to interpret and understand these books so I can interpret and teach them in my ministry context,” she said. The hybrid course format has pros and cons, she said. For Professor Lonnie Yoder, teaching hybrid courses – the psychology of religion class is his seventh hybrid course since 2015 – means adapting content and pedagogy to two different modes in what he describes as an “improvisational dance” that he has found fulfilling. For the initial intensive week, he focuses on building community through personal, active engagement through mini-lectures, small group work, video clips, music and more. Often students will, without prompting, bring food to share with the class, and spend breaks during sessions connecting with each other in the lounge. The subsequent online component allows more time for students to engage with various texts. Yoder creates a short introductory video for each week’s assignment, and grades and returns student work promptly in order to keep students engaged. That engagement is key to having “good energy” in the class, he said.